NBC’s singing competition show “The Voice” finished a strong 14th season of Blind Auditions. 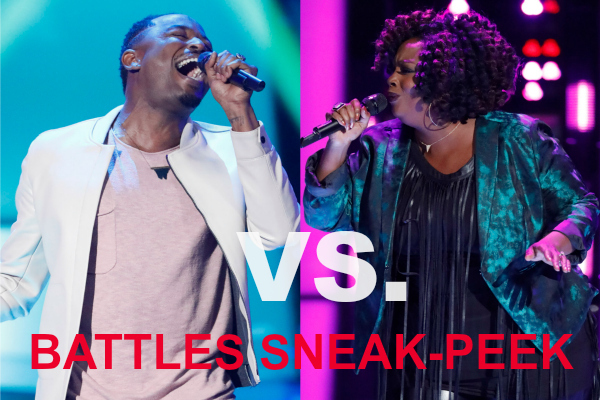 Now, moving into the infamous “Battle Rounds”, where only the strongest vocalist contestants survive, coaches will once again be able to “Steal” their most desirable artists. And, in the tradition of past seasons, there will be some real intense stand-offs between some of the coaches in their attempts to win-over their favorits artists while trying to steal them from each other. In this round, coach Blake Shelton will remind all that just last season he won with one of his Battle Steals – Chloe Kohanski! 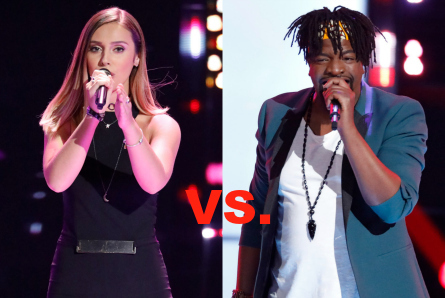 READ on below for what’s to come on this season’s ‘Voice Battles! Kelly used both of her Steals. Adam also used both of his Steals. His last one being when he stole an when he stole Jackie from Team Kelly. Kelly displayed a bit of greeness (we’re not talking about St. Patrick’s day) when she tried to steal a contestant. But, Adam also wanted to steal them. Adam pushed his button way ahead of Kelly. Then Adam played with that fact and also reminded Kelly that she didin’t turn for that artist during the Blinds. But, neither did he! Kelly was really wishy-washy. Finally, Alicia reminded Kelly that she was attempting her last Steal and should make it worth it. She told her to fight. Kelly stepped-up to the plate. But, still lost to Adam. Kelly called Adam “stupid” for pitting Rayshun and Tish against each other. Because, “who do you choose?” Adam said he wanted to put on the best show possible by putting the two equal voices against each other. Blake picked Tish as the winner of the Battle. Adam chose Rayshun. Trish was stolen at the last minute by Kelly. Kelly said the show wouldn’t be true to itself if it allowed an artist like Trish to leave. Jorge brought his guitar and played during his Battle. This impressed some of the coaches. 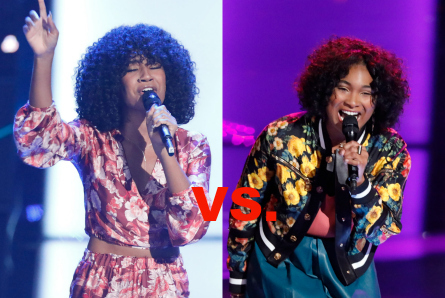 Kelsea and Jordyn battling on “The Voice” stage appeared like mini-Alicia Keys with their similar hair styles and wardorbe to hers. Kelsea is 22-years-old, Jordyn is 17-years-old. Adam said he could hear the difference in the maturity of Kelsea’s voice vs. Jordyn’s young voice. Blake said they’re both young, and not much of a difference. But, all coaches agreed that they liked Kelsea’s graveliness in her voice better. Kelsea won the Battle. Jordyn got stolen by Adam. However, Adam and Kelly battled it out over Jordyn for a good while. Jordyn ultimately chose Adam as her new coach. Blake said the song that they sang wasn’t in any of the two women’s wheelhouses (which was true). The Battle was a close even playing field. Jackie had a slightly more powerful voice. Someone in the audience said the losing artist reminded them of Taylor Swift, and felt she should have won. All the coaches favored Kaleb. Kelly said that there’s something special about Kaleb and he’s a “nice” guy. She called him a “dark horse”. 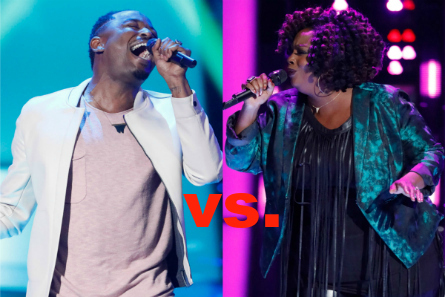 Both of these artists will remain on “The Voice” for the next round because one of the coaches stole the losing artist after this Battle was over. This was the best Battle of the first half of this show date. Jackie and D.R. sang “Sign of the Times” by Harry Styles. This was a great song for their voices and the whole audience went crazy. At the end, all three coaches were on their feet. Kelly was confident that whomever didn’t win the Battle, they would be stolen by another coach. She was right. All three coaches tried to steal Jackie after Kelly chose D.R. as the winner of the Battle. During the fight to win over Jackie, Ailcia reminded them that things come “full circle” on the show because of how she turned for Jackie during the Blinds. But, Jackie chose Kelly during the Blinds. Alicia slammed Kelly when she told Jackie that it’s now how it should have been all along. Kelly laughed the diss off. Blake reminded everyone that it was during the Knockout Rounds when Chloe, who is alternative rock, chose to go with him on her Steal. As all ‘Voice fans know, Chloe won last season. Alicia also added a feminist angle. Adam’s pitch was when he told Jackie that he believed in her from the start, and even said he’d steal her if she didn’t win the Battle. Jackie chose Team Adam. “The Voice” season 14 Battles start on Monday, March 19, 2018. You can get Kelly Clarkson’s look from “The Voice” Battles! Check-out a similar dress we found at Forever 21 HERE! 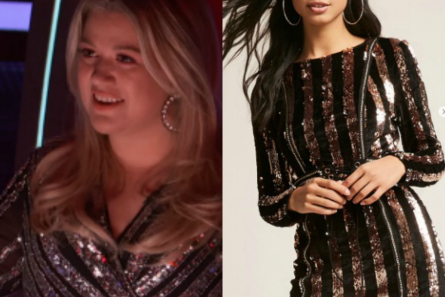 Pictured: The Voice season 14 Battles, Kelly Clarkson – Get the look!